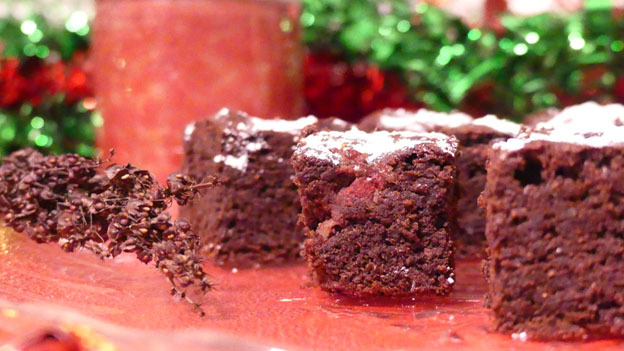 Simple to bake, scrumptious gluten-free chocolate brownies you'll want to share. Loaded with wild goodness, you'll feel great knowing that these taste amazing and are healthy for you and your family. Preheat oven to 350 degrees F. Line a baking pan (9x9in) with parchment or grease. Beat softened butter and sugar together until light and fluffy; then add eggs and vanilla. Blend flour, ground dock seed, cocoa and baking powder together. Slowly beat dry ingredients into the wet ingredients until well blended; about one minute. Spread mix in lined (or greased) baking pan (it will be thick). With a spoon, drop jam in various spots, carefully swirl jam with a knife across the surface mixing it just slightly into the brownie batter. Bake 25 to 30 minutes or until centre comes out clean with a knife. Cut into squares once cooled and enjoy!